Concentrated around one of the most popular parks in Denver, Washington Park is one of oldest neighborhoods in the city. Located in the middle of south Denver, "Wash Park" has both an east and west side with the main attraction being the public park. Washington Park is over one hundred years old. Covering more than 165-acres, Wash Park is one of the biggest in Denver. Named after president George Washington, the park features two scenic lakes and lots of open space. It’s also home to one of the most popular running paths in Denver, which stretches for 2.6 miles around the perimeter of the park. At the park’s core, you'll find the largest flower garden in Denver alongside one of the city’s busiest recreation centers. If that's not enough, there are also two playgrounds, ten tennis courts, and several soccer fields. Smith Lake has a boathouse pavilion that can be rented out for parties or special occasions, with over 250 picnic permits granted annually. Free concerts during the summer have become also become a huge hit with Denver locals. The residential part of the neighborhood is unique and very important to the history of Denver. In fact, many of the homes in West Wash Park are early twentieth century and late ninetieth century Victorian homes that are some of oldest in Denver. However, the area is slowly going through development. New luxury homes, apartments, and condos are becoming more abundant. 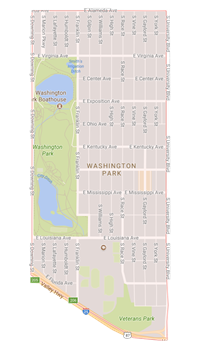 Washington Park has become more popular in recent years thanks to its central location and proximity to the park and local commerce.